Def Leppard and KISS continued the Summer Tour 2014 last night in Atlantic City, NJ with a 14 song set played. The band played the regular 75 minute set at Boardwalk Hall. The show started with the live snippet of 'Won't Get Fooled Again'. The rest of the show was the usual set with no changes from Mansfield/Boston, MA. The show's start time was delayed or changed and started around 15 mins later than usual with Lep on stage just before 8:15pm. 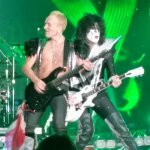 Phil played Deuce with KISS during their show. The band rarely have guests up on stage with them. The song dates from their 1974 debut album. Phil wore a pair of Paul Stanley's boots and outfit plus some face make-up during his guest spot. KISS played a slightly different set order with 'Deuce' played later than normal. Live Blog Setlist/Photo Updates direct from the show happened on this site with help from Michele and Michelle who submitted some great photos.